DIY'ing is Illegal?Eliminate The Muda! Do you ever feel as if you just woke up to a changed world? This country was built upon the backs of settlers that founded our schools, churches and cities. They built their homes and businesses from scratch, felling their own trees to make lumber and painting their own signs. Home ownership and the freedoms that should come with it are part of the American Dream. Along with that privilege, comes responsibility to maintain your home or suffer from its demise. Our Nation enjoys a rich history of people that have struggled to survive and even thrive in large part through their own efforts to do-it-themselves. That might mean replacing your own light switch, building your own home or even building a business. This post was featured on the Yakezie Carnival hosted by Free From Broke. Please follow this link to see other great articles! Since when did doing-it-yourself become illegal? Of course it is not! But that is what unsuspecting consumers are being led to believe. During a follow-up (closing technique warning flag!) visit by a HVAC specialist we were told that installations and repair may only be legally performed by those with the appropriate license. While I began with no intention of making this a DIY project, the more I heard that I was not allowed to work on my own air conditioning system the more I wanted to! The benefit of doing it ourselves was, of course, cost and also control over the quality of work. We all know labor is going to be expensive, one company quoted me $185 per hour for labor! 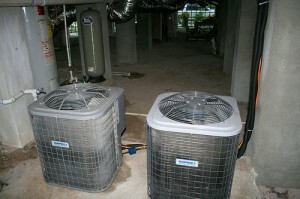 Who is ready to tackle the replacement of a major HVAC component if not the entire system? Not me, with an upcoming meeting to plan, I have too much on my plate as it is. Fundamentally, a conventional refrigerant (Freon) charged central A/C system is extremely simple. There is an electric motor that runs a pump which compresses the refrigerant, turning it into a liquid. The rest of system is a long circuit of tubing that refrigerant runs through. The refrigerant releases heat when it is compressed into a liquid; this liquid begins to cool in the condenser, the big box that sits outside of your house. The refrigerant then passes through the expansion valve turning from a liquid into a gas and getting really cold. At this stage the refrigerant gas passes through evaporator, inside your home, which is in direct path of the flow of air which will cool your home. If you can use a screwdriver, solder and make minor electrical connections you have the skills necessary to work on your own system or even replace it! Admittedly the soldering can be a little tricky and demands some practice on scrap pipe. Certain refrigerants however are federally controlled; including the most common R22 for homes and R12 for automobiles. These products contain chlorofluorocarbons (CFC) that damage the ozone layer. It is against the law to release these gases to the atmosphere and it is against EPA regulations to handle these refrigerants without a license. The contractors tried hard to convince us it is illegal to work on our own system, but it is just not the case. Georgia Title 43, Chapter 14 understandably prevents me from “engaging in the business or profession of a conditioned air contractor without a license as required under this chapter.” But nothing stops you from working on your own. 1) Fill it with freon and see how long it lasts – $250 (does not fix the hole) – plus it is illegal! On the surface the pricing is disturbing. When you look at the details, one cannot help be feel wronged. For the system I needed, the compressor itself was priced at $995. Amazingly you can buy the entire condenser, the machinery outside your house (pictured above) which also includes the compressor, yet it only costs $60 more! R22 refrigerant is $55 per pound which would be used in a repair (option 2) or R410 in a replacement system costs $16 per pound with 4 pounds per system. The evaporator, the unit inside (it is what gets cold) costs $300. So if we are keeping score, labor to repair our system (option 2) is $585 (excl. R22) and of course comes with no guarantee the remaining components will last. The labor to upgrade would be $1381! That is nearly $800 just to replace the evaporator. For the most part, the repair or replacement requires the same skills; some soldering, a few electrical connections and some mechanical work to replace key components. The only challenge is the process of charging the system with refrigerant. This requires some specialized equipment, precise measurements, not to mention the license, and follows an exacting process to ensure the best performance. For this reason alone we decided to stick with a professional. However, we were not about to give our money to anyone that used deceptive Closing Techniques such as fear. It was irritating how commonly the HVAC vendors used scare tactics and threats of fines and imprisonment to pressure me to buy from their companies. I was not willing to give my money to a person that takes this approach. The good news in this ordeal was that we didn’t give up. While some might simply accept the first and maybe most costly estimate, we continued request competitive bids. Eventually we found a licensed technician with zero complaints and in good standing that upgraded us to a R410 system for $700. Additionally he absorbed the cost of the refrigerant and added no mark-up to the parts and supplies, we literally purchased them direct from the supply house. In the end we saved over $900 by taking the time to make a few more phone calls and read a few more articles. And… just an update, in case you wanted to know about our friends… they unfortunately paid double the average estimate I was able to find. We verified their $300 capacitor replacement should have been half as much and that doesn’t include the service plan they purchased as well! 11 comments to DIY’ing is Illegal? As life is getting more an more complicated, we have set up more and more laws to cope with new developments. The building code is one of these things that we have to follow that our ancestors did not have to follow. But many more of our ancestors died in house fires, for example. While these laws and codes may be a nuisance, they have also done some good. I am equally disturbed as you are that some workmen or professionals take advantage of these laws and codes, rip their customers off, and sometimes even deliver mediocre service at best. Therefore, I like to do work around the house myself. Most of the time it is not that complicated and it does save a ton of money. .-= MoneyObedience´s last blog ..Early retirement is a double whammy! =-. Hmm, I see where you’re coming from, but one man’s knowledge of DIY is another man’s bear pit. I could no sooner take the steps you outline than do brain surgery on my own head. The law has to cater for everyone, surely? The alternative – to let people do dangerous things and bill them if they cause damage – is risky in a lot of situations. Anyway, just my devil’s advocate take! Sounds like it definitely pays to shop around! Too many people go with a tech that a neighbor or friend recommends… But honestly, how many times do you call a specialist! .-= Money Reasons´s last blog ..Lemons to Lemonade – Mowing To Excercise and Save Money =-. Persistence is often well worth while and you sound like you got a decent deal…. I know in UK there is work you can do yourself but it needs to be inspected by a professional to make it legal… much cheaper than them doing it. Thanks for the post! Very well thought out and researched! It’s so strange that if you do a little research you can easily save some money. It just goes to show it’s worth it. Thanks again for the post! Just to let you know, this post made the weekly top 5 posts for our website. .-= Conrad´s last blog ..Tips on Budgeting – Why Emergency Funds =-. @MoneyObedience – Admittedly you are correct, civilization and the rules that come with it provide for the greater good. But they too can and do go too far. @Monevator – You don’t believe you could only because you lack the exposure and/or experience. As for the alternative, the combined inflated costs of every repair or replacement to society must be much greater than the cost of the few of us that manage to electrocute ourselves. Freon is controlled but not particularly dangerous. The 220 volts might be another issue. @Money Reason – Being a capitalist at heart, I am all for everyone making a fair profit but when there is a thousand dollar difference you got to wonder what that money is really being used for! @Forest – For major work in many states the same is true, it must be inspected. If multiple companies use the same underhanded tactics, it makes you wonder what percentage of people pay significantly more for their products and services than you and I do? @Conrad – Thanks for the honor Conrad! I’m glad that you didn’t surrender and consequently got a good deal. I ran into something similar when my dryer stopped working. The Sears Repair people (and others) wanted to charge me $200, and I know the problem shouldn’t cost anywhere near that much. I found a local trustworthy guy to fix it for a little over $100. Hmm, well yes if I applied years to learning I could do it. But some people have are naturally talented in certain areas. Long, long, (long) years of arguing this with my dad, who you could drop into a woods with a 9″ hunting knife and he’d build you a house in a week. @Monevator – Would you agree with years of learning that your dad could eventually write a blog post? If it is possible to learn over time, it is possible to learn enough to deal with a pending situation. I’d bet you could learn enough in one day to successfully remove and replace a conventional A/C system. Ironic, I was speaking about this topic with a family member a few days ago when his car needed some repairs. Problem is, he purchased a “rocket scientist” car (I believe he swiped this from a Ford Motors commercial) where it’s quite difficult to do above average maintenance or replace an alternator on any car made after 1995. If you know anything about classic cars or spent some time with a DIY father/grandfather, you’ll notice a trend towards more compact engine compartments and computerized driving systems has made the DIY’ers much more dependent on post-sale, fee-based maintenance. .-= Matt SF´s last blog ..A Faster Way to Review Lending Club Notes =-. Interesting. I agree with your actions though – I always get multiple quotes, and I don’t believe in doing business with anyone that uses deceptive marketing practices. I would rather pay more than give in to deception. Great job saving money! .-= Ryan´s last blog ..How To Find and Hire Reliable Contractors =-.